함양 박씨 문중에서 보관하고 있던 것으로, 주로 조선 후기의 것들이 많은데 그 가운데 연대가 오래된 것과 희귀한 것, 역사적 자료로서 가치가 있는 것 등을 뽑아 7종 46점만을 지정하였다. 『나암수록』을 비롯하여 이외에도 『당시고취』, 『당조책림』, 『만국전도』, 『저상일월』, 『통감』, 『저상일용』등이 있다. 『나암수록』은 구한말 유학자였던 나암 박주대(1836∼1912) 선생이 구한말의 격변하는 당시의 세태와 상황들을 연차적으로 수록한 책이다. 이 책은 함양 박씨 정랑공파 종중에서 보관하고 있는 것으로 미산고택에 보관되어 있다. 『당시고취』는 조선 전기 목간본으로 간행한 책으로 1책(권 1∼4)이며, 『당조책림』은 조선 전기에 당나라 조정의 책문 75문을 편찬한 것이다. 『통감』은 조선 전기 목활자 간행본으로 18권 3책이며, 『만국전도』는 현종 2년(1661)에 박연설이 그린 세계전도로 바다와 육지를 각각 다른 색으로 채색하였으며, 가로 133㎝, 세로 71.5㎝이다. 『저상일월』은 대하일기의 성격이며, 『저상일용』은 6대 140여년 동안 매일 집에서 소요되는 수입과 지출을 상세하게 기록한 것으로 20책이다. 이러한 함양 박씨 소유의 전적들은 조선 후기 당시의 사회, 경제, 문화, 정치 등 다양한 분야의 학술연구에 중요한 자료가 되고 있다. 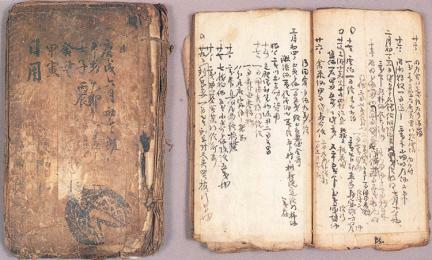 These books have been preserved by Hamyang Bak’s Clan, and they are mostly from the late Joseon Period. Among all the books, 46 in 7 types were collectively designated as Treasure in recognition of their historical values. Written by Bak Ju-dae (pen-name: Naam, 1836-1912), a Confucian scholar of the late Joseon Period, Naam surok records the radically changing social order chronologically. 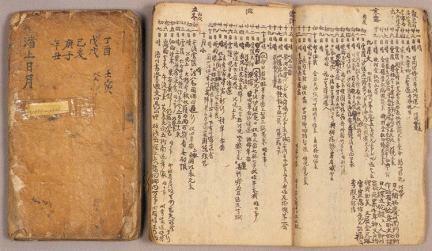 This book is owned by the Jeongnanggong Branch of Hamyang Bak’s Clan and is currently kept at Misan Historic House. 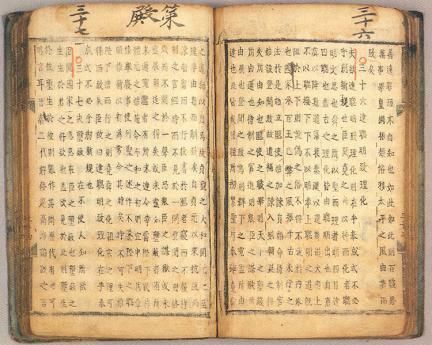 Besides Naam surok, there are various books such as Dang si gochwi, Dang jo chaengnim, Manguk jeondo, Jeosang irwol, Tonggam, and Jeosang iryong. 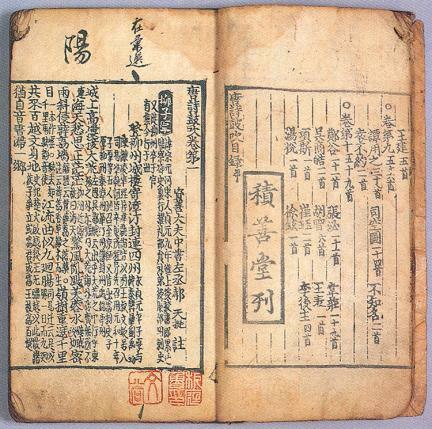 Dang si gochwi is composed of four volumes and was printed with woodblocks in the early Joseon Period, whereas Dang jo chaengnim contains 75 official documents of the Tang Dynasty. 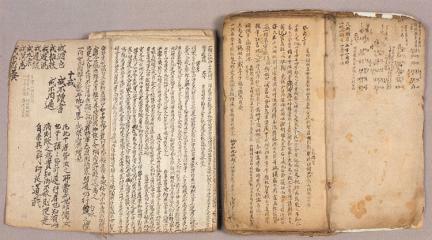 Tonggam is made up of 18 volumes and 3 books and was printed with wooden types in the early Joseon Period. Manguk jeondo is a world atlas painted by Bak Yeon-seol in 1661 (second year of the reign of King Hyeonjong of the Joseon Dynasty). 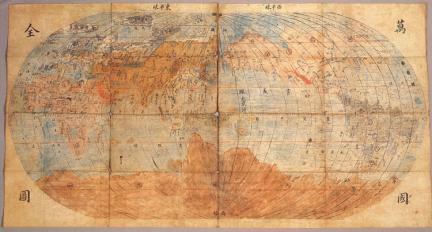 The seas and lands are painted in different colors, and the book measures 133 cm wide and 71.5 cm long. 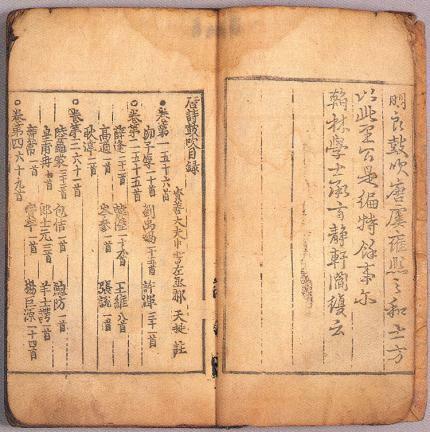 Jeosang irwol is a kind of diary; the 20 books of Jeosang iryong contain records of the income and spending of a family for 140 years over 6 generations. These books provide a wide variety of information on the society, economy, culture, and political affairs during the late Joseon Period.